I don’t remember placing a single ornament on our first ever artificial Christmas tree last year, not even the ones I bought for each of my children. I don’t recall shopping for gifts, wrapping them in patterned paper and shiny bows, or placing them under the tree. I have no idea what we made for the family dinner we hosted on Christmas Eve. I’m certain we did these things. I have the photographic evidence to prove it. But I have no memories. Last year my aunt, who raised me and was a grandmother to my children, died four days before Christmas. She had been ill with pneumonia since Thanksgiving and passed away shortly after her 92nd birthday. Given her age, frailty and poor health, her death was a blessing. But that didn’t make it any easier for her children, grandchildren and all those who loved her to let her go. The weeks surrounding my aunt’s death were a numb blur, and the holidays became something to endure rather than enjoy. I can see it in my glassy eyes and forced smile in a photograph of my husband and me that I don’t recall being taken on Christmas Eve. 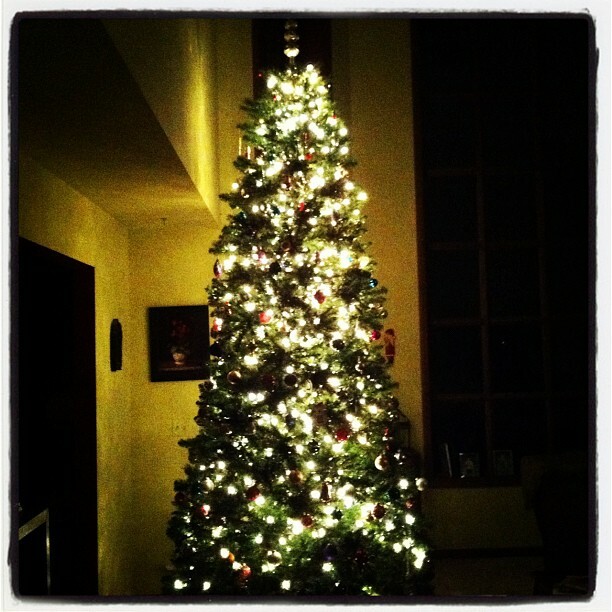 It appears that I put on the “happy mommy” show as best I could for my family, but it was as phony as our new tree. After the holidays, we packed up the 12-foot, pre-lit tree, which my husband hated and hadn’t wanted to buy in the first place. He swore we’d get a real tree next Christmas. I don’t remember caring too much one way or another about the tree being artificial. I just didn’t want to look at it anymore. As the weeks and months passed and took us further away from Christmas, my numbness faded. It may not be the nature of grief to release us entirely, but it does slowly loosen its grip. The darkness gradually lifts, and the good days, so fleeting initially, grow more frequent. The ghosts of our memories move to the outskirts of our thoughts, and we focus on those who remain before us. We remember to feel, we remember to live, and we desire to do both. This year my husband tried to convince me to get a real tree, but I wanted to give “Tree-hemoth” a second chance. I even managed to talk him into putting it up the week after Thanksgiving, which is early for last-minute holiday non-planners like us. The door of my home office stays open all day so I can admire my glimmering fake fir. I am feeling festive without pretending, but I haven’t deluded myself into expecting a picture-perfect holiday. I know there will be stress, and some things will go wrong. I will miss my aunt and everyone else who is no longer with us or cannot be here. But I’m ready to make new, happy memories with my family. My smile in this year’s photo will be real. This entry was posted in Family, Motherhood, Yeah Write and tagged Christmas, holidays, loss of parent by Michigan Left. Bookmark the permalink. I am so very sorry for your loss. My cousin died 5 days before Christmas about 7 years ago. Although he had been in the hospital it was totally unexpected. He was suppose to make a full recovery. It was not suppose to happen that way. I hope you find comfort in your memories. That’s awful, Robbie. I am so sorry. Your poor family. It’s never easy but for it to come as such as a shock must have been devastating. Love this, and I can so relate. My first husband died about three weeks before Christmas, six years ago. I remember almost nothing about it. Oh, my gosh, Greta. I had no idea. I can’t even imagine what that must have been like for you. What a blessing that you went on to find love and happiness, and have a beautiful family! Hugs to you. I’m so very sorry for your loss. An anniversary surrounding a loss can be really, really hard. Hang in there! And beautiful, touching post. Thanks, Larks. I’m determined to make the most of this holiday season and remember every minute. I’m sorry for your loss, but I’m glad you’re determined to make new, happy memories this year. Thanks, Bee. Happiness is a choice. I truly believe that. Tree-hemoth started with a real tree we had two years ago. It was just as tall and twice as wide. It barely fit in our living room. I’m very sorry for your loss. Beautifully written post. I am sorry for your loss. This beautifully told. I especially enjoyed the line: We remember to feel, we remember to live, and we desire to do both. The desire is the biggest part of that. It’s a beautiful, perfectly phrased line so and excellent reflection on the ups and downs of lifes. I hope you have a happier holiday, my friend. Thoughts and prayers for you! Thanks so much, Angela. You are very right about the desire being key. Very right. so sad about your aunt. i lost my grandma who was 90 in january of last year, and i share much of well written feelings of numbing grief. i know very well how to smile without feeling happy. hope this year brings you some real joy. Thanks, mama. I’m sorry about your grandma. People say, “She lived a long, full life.” It’s true. But it doesn’t make us miss them any less, does it? Thanks, Cindy. That means so much to me coming from you. And I’m glad you liked Tree-hemoth too. Wow. Your tree does look beautiful. My father is elderly and in the hospital right now. I’m debating whether I should pick up everything and head down to Florida. it’s like so much of him has already slipped away. The body does wear out but it’s not easy for any of us to watch. That is such a tough call, I know. I will say that I’m sorry I didn’t visit my aunt/mom sooner. By the time we saw her in early December, she was already slipping away. It would have been so wonderful for my kids to have had some more happy, healthy memories with her. I regret that I can’t change that. Hugs to you. I will keep your father in my thoughts and prayers. No one should be allowed to die around the holidays. It’s too much. I am sorry for your experience, but this piece is so lovely and true. We face the real v artificial debate every year and my hubs is jewish. I love how you wrote this. So real or fake? Which side are you on? I love real trees, but I’m convinced they were the reason my son, who has allergies, kept getting sinus infections around the holidays. My husband thinks I’m nuts, but my son was definitely healthier last year with fake Tree-hemoth. And, I have to admit, I LOVE not having to vacuum up all those needles every day. This is so lovely. I keep reading the sentence you wrote about grief over and over again. It really is true that the edges of grief soften over time, so while we will never be completely the same after a great loss, life marches on, and happiness returns. Wishing you the happiest of happy holidays this year. Smile big. Thanks so much, sweet Samantha. Your comment just made me smile big. Happy holidays to you and my traffic hero too! Wonderful! You know, this year I am feeling so much happier about the holidays, and it surprises me. For so long, I have been a grinch about it. After my daughters and ex-wife moved back to Virginia six years ago, I started getting a knot in my stomach each Christmas. Not this year, it has finally passed, like the ghost you spoke of moving to the outskirts. We are meant to be happy, and often it is just a matter of time. So glad that time is being kind to you! Thanks, Bill. And I’m glad you’re feeling the holiday spirit too this year. Wishing you much happiness. The ghosts moving to the outskirts describes it well. However, no one should have to experience loss like this at Christmas times but it happens and I’m so sorry for yours. The “Tree-hemoth” is so pretty in the picture and I’m hoping this finds you in a peaceful place. As sad as your story was, it was so beautifully written. Thanks, Gina. I needed to “write it out,” I guess, and I’m glad I did. I really want to focus on feeling the joy this year. Your tree is lovely and so is this post. Last year was a strange Christmas for me, too. My dad’s wife had been in a terrible accident before Thanksgiving and they were not able to travel anywhere, plus my grandmother had died in February, so it was very strange to not be with my dad or grandmother for the first time ever. Even harder because it was the twins’ first Christmas and I wanted to be happy, happy, happy, but I wasn’t. Oh, and as a person with crazy allergies, a fake tree is better. Sure, it can collect dust, but there’s no pollen, which is huge. I’m so sorry you had a rough Christmas last year. I hope this one is filled with all the happiness you deserve, mama. The holidays are so hard to do when you lose a loved one. Their absence is so blatantly obvious, especially the first holiday after they have passed. May you have a joyous Christmas with your family this year. We are never guaranteed another one. Thanks, Laura. And that is exactly what I’m trying to focus on: cherishing the moments while we still have them. Happy holidays to you and your family too! I’m so sorry for your loss. Losing loved ones is hard enough, but at the holidays it feels that much harder. Wishing you a peaceful holiday season. Thanks, Michelle. Happy holidays to you too, friend! I hope this year is a more peaceful holiday for you. I think Tree-hemoth is beautiful! Awww, thanks. He’s a keeper — even if my husband doesn’t agree. I remember 1 year ago today getting a text from my dear friend who needed a shoulder. I also recall heading to the local biker bar in my sweatpants to hear amazing stories about your Mom / Aunt. Thelma lives in your heart everyday and is a constant inspiration to you as a mother. Extra hugs today and the whole holiday season. Thanks, mama. Trying to stay focused on what is ahead of me instead of what’s behind me. So far so good. Oh I am so sorry about your loss! Your Aunt sounds like a beautiful woman. You’ve written about her before, haven’t you? My memory is not what it should be! I love the way you describe grief, and I am glad that you have fought your battle with it over the past year, and have come out on the sunny side. I think having the realistic expectations that you do will help keep things smooth this year for you. Plus that 12 foot tree will keep things festive I’m sure! TWELVE FEET!! Wow! I’m pretty jealous about that tree, artificial or not! Thanks, Dawn. It feels so good to be on the sunny side again. I hope things are looking brighter in your world too. Hugs to you and your family. Wishing you a wonderful holiday season! P.S. Tree-hemoth is quite a sight, isn’t he? I’m glad you like him. My mother died two weeks before Christmas, 11 years ago. I can imagine how you feel. Christmas is hard. Kids make it a little easier. Thanks, Trish. It’s so difficult to have to associate loss with what is supposed to be a happy time, isn’t it? You are so right, though, about kids making it easier. I’ve lost my dad and aunt/mom since I had children. I wonder sometimes where I would be if I hadn’t had to be strong for them. Wishing you and your family a peaceful, joyful holiday. My mom died a few weeks before Thanksgiving, and I alternate between remembering every moment post-her-absence to not remembering a thing. Thank you for sharing this and may you and the family and the treehemoth have a beautiful holiday. Thanks so much, Deb, for your lovely comment and for the comfort of this link-up. What a great idea at a time when we all need it the most! Happy holidays to you and yours as well!